If you’re looking for a fun craft and a great way to encourage your kids to save for some family fun, allow me to introduce The Travel Jar! The travel jar became a unique feature at our home nearly four years ago, after a friend suggested that we begin saving our loose coins to put towards our fun trips. She shared that her family was able to experience a once in a lifetime dream vacation, in part because they were able to save so much money by adding all of their change to a jar over a period of two years. Her comment certainly began turning the wheels in my head. At that time, other than using our change in pop machines or stamp vending machines, my change seemed to normally settle into the depths of my purse. When it finally becomes too heavy to drag around, I’d dig it out and find it another temporary home. The thought of saving money for fun outings was certainly appealing. I certainly wanted a jar designated as a travel jar, but just any old jar would not do. I needed something special. So I nosed around in a few thrift stores and indoor flea markets but I was unable to find exactly what I wanted. It was then that I remembered all my cute scrap booking stickers that were of course travel themed. The stickers would be a perfect fit for a huge pickle jar that I already had tucked under my kitchen sink. So, the kids and I had a fun project day and made our own travel jar and we love it! It’s a special and unique, one-of-a-kind Prater Family masterpiece! You can create your own work of art. 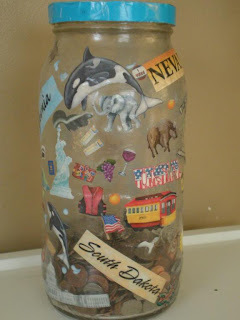 All you need is a jar, (we used a huge pickle jar from Walmart), Mod Podge and travel stickers or pictures cut from magazines. Simply clean and dry your empty jar, smear a section with a thin coat of Mod Podge, apply the travel stickers or pictures and coat with another coat of Mod Podge. I simply used scrapbooking paper and Mod Podge for the lid. 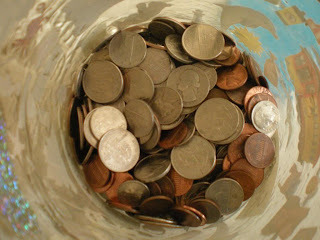 You’ll be amazed at how fast you’re pennies add up once you begin saving! Over the past four years, our travel jar has been used on many occasions.On one trip, we divided the money between the kids and they each received over $30 to spend on our trip. This was a great way for us to give each of the children money to spend on souvenirs without adding to the budget. Our travel jar money has also paid for field trips, an annual museum membership pass that we use for reciprocal admissions to other museums and countless cans of pop when we were too weak to stay out of our change! I really wish I would have thought to purchase this bank to decorate. After all, how can you argue with a bank that counts your change for you? Do you set aside money for field trips, family outings or travel? How do you save? 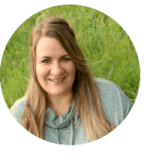 © 2010 – 2017, Tonya Prater. All rights reserved. Love the ideas and the pics! 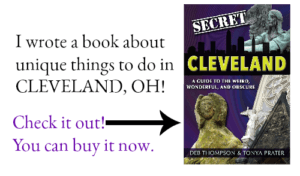 I featured you at the blog brew review today! Great idea! The boys would love knowing they helped fund trips! Thanks!